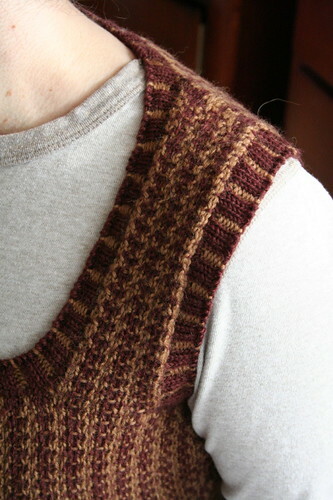 Last fall, my cousin Ida asked me to knit her a long wool vest. With the help of Ravelry, she picked out Bryant’s Slipover. I decided to use Brown Sheep Nature Spun Sport instead of DROPS Alpaca. Ida wanted a sturdy vest so a light alpaca yarn would have been inappropriate. It took me a whole year to cast on but less than two weeks to knit. It was a great project to bring with me to Boston because the stitch pattern was very easy and required little attention. Furthermore, at a gauge of 30 sts/4″, there was a lot of mindless knitting to do so it was perfect for long travel delays. As of this morning, Ida’s vest is ready to mail! I hope I will be able to post pictures of Ida wearing this in the near future. Until then, you get me. I made many modifications to this pattern. The only elements that remain of the original design are the stitch pattern and plunging neck. The pattern called for knitting the pieces separately and then seaming them together. Since the stitch pattern is essentially a two-row stripe of each color, I felt seams would be unsightly; indeed, some examples on Ravelry bear this out. 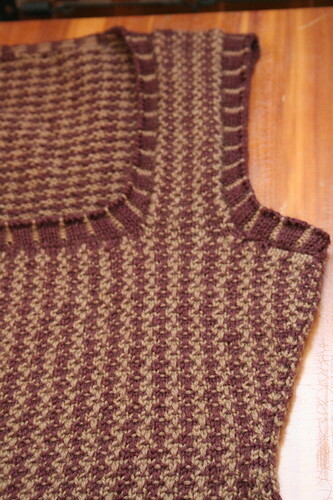 Instead, I altered the stitch pattern to knit the vest in the round. Had I not wanted to try the vest on Ida over the weekend, I would have steeked the armholes and neck just to avoid having to knit back and forth. As far as I am concerned, it would be foolish to knit this any other way but in the round. The pattern called for 5×5 ribbing in the main color; however, I decided to use a 3×1 corrugated ribbing because I thought it would look better with the tension of the stitch pattern. 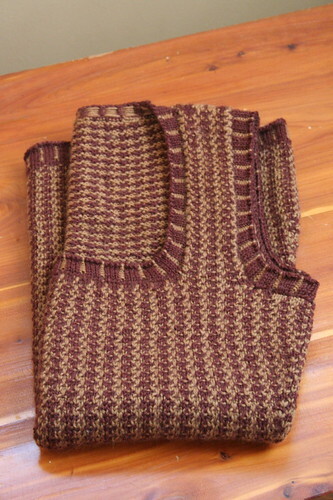 Although I love how the vest looks, I found the pattern difficult to wrangle. For example, the gauge was reported to be 8 stitches and 12 rows/inch and the armhole depth I chose was 7″. Normally, I would divide my stitch gauge by my row gauge to determine approximately how many stitches to pick up at the edges. In my case, I planned to pick up two stitches for every three rows and then all of the bound off stitches across the back and front, adding a few here and there at the corners to close holes. Next, I would look at the pattern to see how many decreases I would need to do to arrive at the requisite number of stitches. This is where I ran into trouble. At perfect row and stitch gauge, I picked up 244 stitches for the neckline. The pattern called for 150. I decreased down to 180 but I wish I had only cut down to 200 stitches. The armhole and neck edging actually shortened the armhole depth by a full inch. 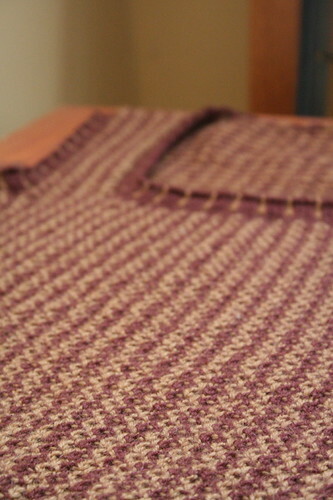 I was able to stretch it back when I blocked the garment but it would have been better to pick up more stitches. The result is that the neckline will not be as deep as Ida had hoped, I’m afraid. I am a little concerned about the armhole being too shallow for her. It fits me perfectly but she’s taller so I don’t know if it will work for her. I will rip the edgings and redo them if the armhole is too constricting. With any luck, this vest will be on its way to Berlin tomorrow! If it fits, there may be some modeled pictures in the near future! Less than 2 weeks?! Wow! I love this! It looks really great! 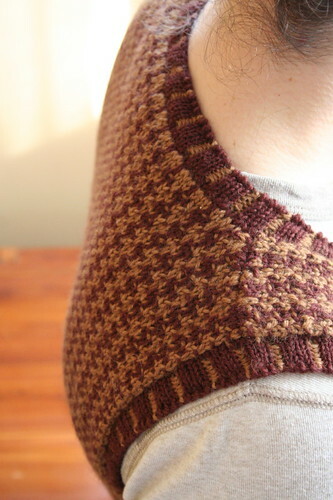 I just bought some yarn at Rhinebeck yesterday that would work well for this vest… I wonder if I should make it! So so pretty, will you knit me one? 😉 I hope it fits her so that you don’t have to tinker with it, it looks just lovely. I just love your beautiful photos and your detailed mod notes! Great, neutral color choice for the vest. I hope she is someone who really appreciates knit gifts! I hope it fits her as well as it fits you. Nice changes to the pattern, and thanks for describing your process. It’s gorgeous. And how appropriate that you worked on it in Boston, with that BC color scheme. I love this pattern and yours turned out just beautiful. If I ever knit it, I’ll be sure to refer to your notes and knit it in the round. Thanks for that! I love this knit! I had never seen it before, but now I’m considering making it for myself though the problems you had make me a little nervous. Love the colors. Lovely vest! I also want to send you a picture of a finished baby hoodie! I knitted one for a preemie from my church this summer and I saw him on Sunday all decked out in his cute little sweater! He was so adorable that I figured you might want to see. Fabulous pattern… thanks for sharing! it’s beautiful! i like the modifications you made, but i hope it fits her as well! Beautiful job on that, and good for you to make the necessary modifications! i love it!!! great color combo. It looks great, E! I think your cousin will love it! And so now what do you knit?! That is fantastic! What a nice gift that is for your cousin. It’s so lovely & I love the colors combination. It’s a great idea to knit in the round & I would have done the same. Great job! Wow…… and it’s a gift! Wow- you are a serious Knitter, girl. When/if a pattern gives me that much headache, I can it. But you’ve turned out something great! Patterns as inspiration rather than prescription…above my paygrade, but obviously within your grasp! ida is going to be so happy. Wow you’ve been busy – I however, have been distracted, just catching up now. Love that vest and the cardigan! I love it, great colors! I want to see how long it is….